You should choose the The Granada Inn backpackers hostel if you want a slightly quieter, comfortable stay rather than one of the "party" hostels like Oasis. This place is perfect for a slightly old group who also want a fun and interesting stay in Granada. Granada Inn features spacious dorm-rooms all complete with Ensuite bathroom facilities. The "dorm-rooms" themselves are divided up throughout an apartment so that you have lots of privacy, peace and quiet during your stay. Lockers for security, internet terminals and wifi are all free of charge. Each "dormroom" even comes with it's very own balcony, and a fully stocked kitchen for all your cooking needs (although with the free tapas in Granada, you may not use it so much). Common space to meet other travellers is not a problem here with our grand furnished open-air patio placed smack-dab in the middle of the complex! Come check it out for yourself and enjoy a unique "Hostelinn" Dormroom Experience. A complete upgrade from our Hostel Dorms. This option is for people who like having all commodities of staying in a touristic apartment but are not traveling in a group big enough for one. In our backpackers apartments you will not share a "dorm-room" of 6 people rather a complete APARTMENT! 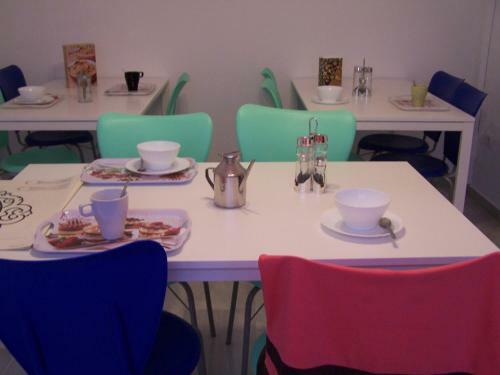 Each apartment comes with its own fully equipped kitchen, dining table, sofa, reading lounge and bathroom facilities. The apartment is divided into separate rooms so you will have more privacy and peace and quiet, and there are even double beds in each apartment available upon request. Each apartment has windows overlooking our grand patio. This hotel is 1455 metres from the Alhambra entrance, 654 metres from Plaza Nueva (the absolute centre of Granada), 1693 metres from the train station and 3303 metres from the bus station. 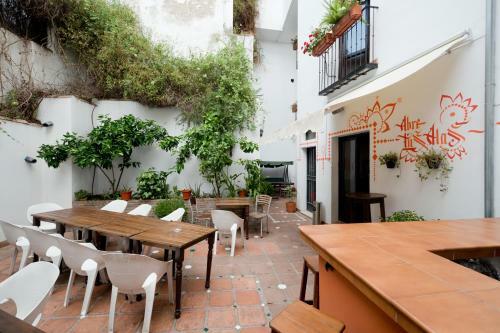 Centrally located, surrounded by shops and restaurants and just a 5-minute walk from Granada’s Cathedral, Granada Old Town Hostel offers air-conditioned rooms and free Wi-Fi in public areas. Rooms are bright and beautifully decorated. This hotel is 1561 metres from the Alhambra entrance, 648 metres from Plaza Nueva (the absolute centre of Granada), 1530 metres from the train station and 3152 metres from the bus station.